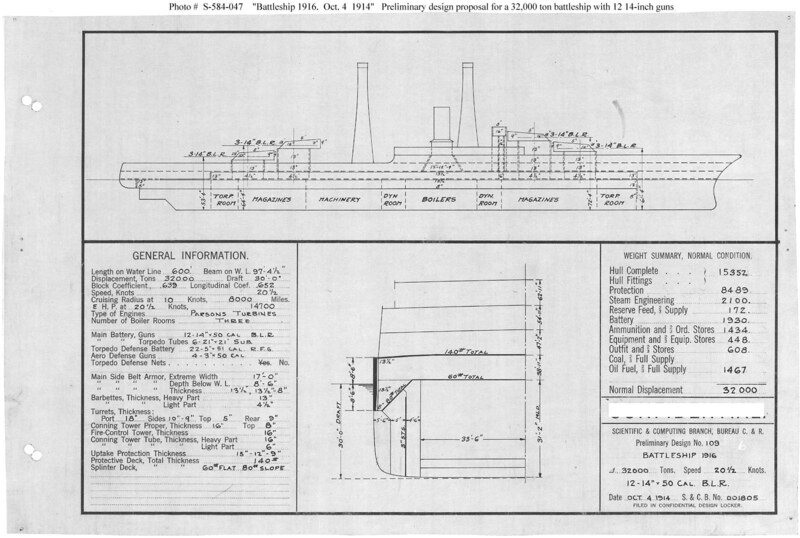 Design drawing illustrating a potential change to the features planned for Battleship # 43 of the Fiscal Year 1916 shipbuilding program. The Secretary of the Navy directed on 30 July 1914 that this design would be the same as the previous Battleship # 40 class (see Photo # S-584-044), except that speed would be reduced one-half knot to 20.5 knots. This drawing shows the side protection system of vertical bulkheads on each side widened by 4 feet 3 inches to a total of 15 feet and one additional vertical bulkhead added. The design was changed significantly, and finally, a month later to provide five vertical bulkheads inside the shell with the protective decks flat above them. This plan provides twelve 14-inch guns, turbine machinery, and a speed of 20.5 knots in a ship 600 feet long on the waterline, 97 feet 4.5 inches in beam, and with a normal displacement of 32,000 tons.